I believe firmly in the idea that every organization gets the culture they deserve. Perhaps the Church over time has contributed to the great error described above by focusing too much on morality as such and not on transformation. Perhaps Christian education has concerned itself too much at various times with mere outward good results and good looks rather than giving a firm foundation in eternal principles. 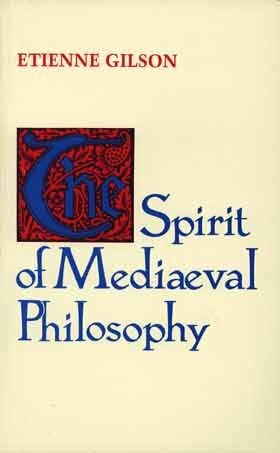 In his The Spirit of Medieval Philosophy Etienne Gilson sets out to refute those who wish to keep Christian belief in a small corner. Gilson was a pre-eminent scholar and philosopher in his day, and alas for me, some of his philosophical vocabulary went over my head. But one of the great strengths of his work is its simplicity. He asks the critic to please, just actually read the Bible and Christian theologians honestly, and the idea that Christian belief was never “philosophical” melts away. For starters we have the book of Job as a deep philosophical statement on the nature of suffering. Many Old Testament history books like the book of Judges show artful arrangement to make pointed statements about the nature of man. We have Ecclesiastes and many Psalms. Some would say Jesus said nothing “philosophical” but this can only possibly hold water if one discounts the Gospel of John entirely. Then of course we have the “dreaded” St. Paul who “intruded” with his theological cast of mind, and so on, and so on. Gilson’s main point, however, deals with the Middle Ages. Here most critics (at least in his day) stated that whatever philosophy the medievals attempted strictly copied from the Greeks. They had no originality. Gilson’s quick retort to this deals with the nature of originality itself. In one sense, “all philosophy is a footnote to Plato,” as Alfred North Whitehead stated. Of course the medievals took some ideas from the Greeks. What philosopher would not? By revealing to man what he could not actually know, revelation opens up the way for the work of reason. Fate had weighed too heavily on men’s mind’s to be too summarily dismissed. Boethius took the trouble to put up some rather complicated architecture in order to ensure it a niche in the Christian temple. Providence is then the divine intelligence comprehending all things in the world; that is to say their natures and the laws of their development. As reunited therefore in the divine ideas the universal order is one with Providence; as particularized, broken up, and so to speak, incorporated with the the things it rules, the providential order may be called Fate. All that is subject to Fate is thus subject to Providence, since Fate depends on Providence as a consequence on its principle. For as the innermost of several circles revolving around the same center approaches the simplicity of the mid-most point . . . while the outermost, whirled in an ampler orbit takes in a wider sweep of space–even so whatever departs from the Primal mind is involved more deeply in the meshes of fate, and things are free from fate in proportion as they seek to approach the center; while if aught cleaves close to the supreme mind in absolute fixity, this too, being free from movement, rises above Necessity. Therefore as is reasoning to pure intelligence, as that which is generated to that which is, time to eternity, a circle to its center, so is the shifting series of fate to the steadfastness and simplicity of providence. I admit I don’t fully understand it, nor might I buy what he sells. Whatever the explanation, I think it best to avoid the word “Fate” altogether. But who wouldn’t smile at Boethius’ boyish enthusiasm and deft mental gymnastics? Aquinas, to my mind a more mature and clearer thinker than Boethius, rejects this concept of Fate as well. I’m sure that Aquinas understood him, and I’ll stick with his analysis. Of particular interest to me was Gilson’s explanation of the medieval view of history. Previous historians in the Greek and Roman tradition did brilliant work. But even the best of the ancients, i.e. Herodotus, Thucydides, and Polybius, all show the tendency toward Fate and Inevitability. For Herodotus, everyone eventually crosses the boundaries of natural law — even Cyrus — and gets crushed for it. Thucydides sees civilization doomed by the passions and fears of man that lie just below the surface. Even the more spiritually minded Polybius sees mighty Rome caught up in the grand cycle of growth, peak, and decay from which they cannot escape. Medievals demonstrated originality in their historical vision. They saw linear progression where others saw only vicious cycle. With revelation illumining reason we can build on the past, move forward, and advance. The medievals had humility in relation to the past. They knew the Romans and Greeks had done better than they in most ways. But they never felt imprisoned by that presumption. Rather, they sought to press on and hopefully help carry mankind to a better place. In comparison to what came before, Gilson rightly claims this as an original philosophical development. This view of history has its roots of course in theology. History is a poem, which makes sense only when we know the beginning and the end. Thanks to revelation, we know both, and can now see Christ building His kingdom on Earth, one that grows as a mustard seed. If God be true, we have the opportunity to progress in relation to the past, though of course we may reject that chance. This explains Boethius’ desire to save Fate from the chopping block — we must save everything so we can build on everything — but it also explains Aquinas refusal to yield. God binds no one by Fate. Otherwise, how can God’s kingdom advance? The medievals, often portrayed as dour and gloomy, strike me as a hopeful people. *Perhaps one example of this is the doctrine of the Trinity, a reality beyond the realm of reason. But after revelation announces the doctrine, reason and experience can then deepen our understanding, which seems to be the experience of the early Church. Some might argue that history constrains us. Certainly many teenagers keenly feel the question, “Why does it have to be this way? Why must the world work as it does?” The dynamism of youth and their imaginations certainly can do wonders for any society. We may suppose that a world without historical awareness will create a glorious whole new world of possibilities. But . . . history rather pedantically suggests that the opposite of the case. Recall the French Revolution, for example. They remade everything, even their sense of time. But this confusion and disruption led to terrible tyranny and mass incarceration. The communist regimes of the 20th century show this same tendency. Only the most bold would call Soviet-era culture stimulating and full of possibilities. Their narrowness of vision–a narrowness made possible and even likely by their disrespect to history–created a terrible tyranny. When I attended the convention [The National Association for Campus Activities] in Minneapolis in February, I saw ample evidence of the repressive atmosphere that Rock and Seinfeld described, as well as another, not unrelated factor: the infantilization of the American undergraduate, and this character’s evolving status in the world of higher learning—less a student than a consumer, someone whose whims and affectations (political, sexual, pseudo-intellectual) must be constantly supported and championed. To understand this change, it helps to think of college not as an institution of scholarly pursuit but as the all-inclusive resort that it has in recent years become—and then to think of the undergraduate who drops out or transfers as an early checkout. Keeping hold of that kid for all four years has become a central obsession of the higher-ed-industrial complex. How do you do it? In part, by importing enough jesters and bards to keep him from wandering away to someplace more entertaining, taking his Pell grant and his 529 plan and his student loans with him. But which jesters, which bards? Ones who can handle the challenge. Because when you put all of these forces together—political correctness, coddling, and the need to keep kids at once amused and unoffended (not to mention the absence of a two-drink minimum and its crowd-lubricating effect)—the black-box theater of an obscure liberal-arts college deep in flyover territory may just be the toughest comedy room in the country. It has been said that we live in an increasingly divided media universe but on many issues I think we live in an increasingly uniform media universe. Social media is so ubiquitous and the same things sell so widely that I suspect the collective consciousness is less fragmentary than in the past. There are no clear good and bad characters in your stories. How then can the people understand the story (i.e., the story alienates the masses, which is de-facto anti-communist)? Which characters in the story definitively represent the author’s point of view? In other words, which character speaks for the author, and which characters serve as foils? This particular attack assumes that 1) The relationship between characters in the story and the author is always strictly linear and 1-1, and 2) This relationship is necessary for clarity in the story, and 3) Without this clarity, how can we judge if you are a threat to the state or not? Prosecutor (reading): “I hate them [referring to those in power] so much I have spasms, I scream, I tremble.” Well, Daniel, what are we to make of this? Daniel: That is an epigraph to the character’s thoughts (laughter in the courtroom, Daniel looks around nervously). Prosecutor: Who is that you hate so? Who do you want to destroy? Daniel: To whom are you talking? To me, or to my character, or to someone else? Prosecutor: Who is your positive hero? Who expresses your point of view in the story? Daniel: I have told you, the story has no entirely positive hero and there doesn’t have to be one. Prosecutor: Who expresses the author’s credo? Daniel: The characters do express the author’s thoughts, but only in part. No single character represents the author. Maybe [my story is] bad literature, but it is literature, and it doesn’t divide everything into black and white. . . . The indictment states that I express my ideas “through the mouths of my characters.” That is a naive accusation, to put it mildly. Neither author had success discussing the nuance of how stories work. Both received labor camp sentences of 5-7 years. In his Conversations with Stalin Milovan Djilas tells of his initial fascination with Stalin and the Soviet Union and his subsequent disenchantment in a few short years. Many other works give many more details about the horror and oppression in Stalinist Russia. What made Djilas’ account interesting was that he framed his account not so much in terms of how it all went wrong, but how it managed to work at all. That is, we know Stalin was bad, but if he was so bad, why did Soviet Russia prosper and gain power, at least in certain ways? He explores this in different ways. For example, no one questions that the purges in the military during the 1930’s sacrificed thousands to Stalin’s paranoia, but Djilas had met many of the commanders put in place after the purges, and admitted that they were almost all quite adept, fearless, and devoted. Naturally, Stalin had his entourage that rarely, if ever, challenged him. As you would expect, one always had to constantly avoid saying the wrong thing by following keenly the bouncing ball of “official” opinion. But unlike most other autocrats throughout history, Stalin did actual work and remained very well informed. He could incisively size up personalities in the room and control it with ease. 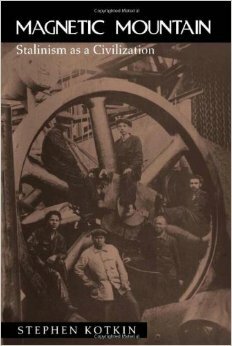 Perhaps unconsciously, Djilas reveals that Maxism has its roots not in economics, politics, or a new conception of proletarian culture, but in a new religious understanding of the world–a naked struggle for will and power. It is this elemental understanding of things that can give regimes who build on this faith a concentrated vitality, akin to the power of art in certain barbarian civilizations. * Perhaps Stalin understood this as well, to great and terrible effect. Today most of us immediately understand the danger’s of the far-right, perhaps because the far-right has a crystal-clear idea of what they want and express it forcefully. Many on the far-left, on the other hand–quite prevalent on many campuses today–seem to think that their ideas will lead to a bright, sunlit land where everyone loves everyone else (the far-right has no such plan and no such delusion). But if you can’t take a joke, you will dramatically narrow your world, after which, you will have nothing to fall-back on other than the paganism of power and will. *Though I would love to claim this insight about “barbarian art,” it belongs entirely to the inimitable Kenneth Clark. He argued that the concentrated narrowness of barbarian civilizations can give their art a certain vitality. Some years ago I saw a video about the emergence of Greek culture and the talking heads discussed the magnificent achievements of Greek drama. Before talking about the drama itself, they mentioned the origins of drama, though only very briefly. After all, Greek drama began in the worship of Dionysius, a confusing and strange subject for modern ears. I found it fascinating to watch the speakers deal with this aspect of Greek civilization. They hated being on unfamiliar territory — unfamiliar not so much intellectually, that is, but emotionally and experientially. Dionysian worship started with women sneaking off illegally or at least shamefully, for their rites. Dionysius himself occupied, at minimum, the barest fringe of Greek religion. Some of the commentators latched onto this, for it promised a narrative we could identify with. “Aha! A sisterhood of oppressed women! And observe the vital contribution they made to their society and the world at large, etc.” But Dionysian rites also involved men, too, so they couldn’t press that narrative too far. The Dionysian rites for women also seemed to involve ecstatic experiences invoking bulls, snakes, wine, and so on. This too got the barest mention, for the “oppressed sisterhood” narrative didn’t really match the fact that Dionysius was a fertility god, and so the women may have been praying and dancing furiously for the chance to have children, a very traditional “role” (ha!) for women to play. To add insult to injury, male Dionysian worship may have invoked blessings to “survive ordeals.” This got no mention at all. It appears that these “rebels” danced around madly and got drunk to attempt to fulfill the most prosaic of traditional gender roles of “tough guy,” and “nurturing mother.” This square peg had no place in their round hole interpretations. I don’t like anything Tennyson wrote (to be fair I’ve read very few of his works), but his poem “The Lady of Shallot” intrigues me in one way. The Lady in question deals with a curse, and can only look at reflections in a mirror to ascertain reality. The mirror of course serves as a poor substitute of reality, and later cracks upon her sad and untimely death. Tennyson’s work came from the same spiritual place as the dreaded pre-Raphaelites, whose paintings reveal an intense desire to recover something of antiquity. And yet the grossly over-dramatized version of the past in their eyes reveals far more about themselves, with their aspirations fit perhaps for the teenage soul more than an adult world (hence L.M. Montgomery has her young Anne of Green Gables grow fascinated with the “Lady of Shallot”). All of us tend to distort reality to fit our own images of it, but the way the Parthenon has been interpreted over time stands as one of the more curious episodes of this typical human folly. Joan Breton Connelly chronicles this and gives her own interpretation of the architectural masterpiece in her recent book, The Parthenon Enigma. The building occupies pride of place in the history of western civilization. Its marble facade inspired those who saw it to grand notions of ideal beauty. The building’s perfect proportions inspired noble visions of clarity and a sense of true humanity. Certain technical achievements of the building are practically unparalleled. But we made the building in our own image, and Connelly writes to set the record straight. Ever since the Enlightenment we have seen the Parthenon as reflecting the “humanism” of the Athenians. We have some justification for this. If you trace the religion of the Athenians one sees a clear descent from Aeschylus (who takes religion seriously) to Thucydides (who didn’t). The Athenians elected Pericles to multiple terms of their highest office, and he certainly fits the humanist mold. Observers therefore assumed, as the Parthenon was Pericles’ project that it would reflect his values. Then again, maybe not. She has two main arguments, with the first drawn from the he Parthenon friezes, long thought to depict contemporary Athenians mingling with the gods. Connelly has an ironclad argument that Athens instead hearkens to not to its present but its mythological past. At Athens’ founding it had a king named Erechtheus, who had three daughters that sacrificed themselves that Athens might survive (images below on a Parthenon frieze). Athens makes an explicit statement, and explicit prayer of hope, that death might come from life with the Parthenon. Amidst our wondering at the architectural genius of the building and the democratic (and therefore mostly familiar) practices of the Athenians, we forget that the Parthenon was a temple to Athena. Excavations show that they built the Parthenon on top of an older temple, so clearly the Parthenon was sacred space, and not merely civic space with a civic purpose. Modern eyes miss many such death-life associations in Greece. For example, look up any article on Corinthian columns and you will likely see something about their fancy, or perhaps excessive, ornamentation. 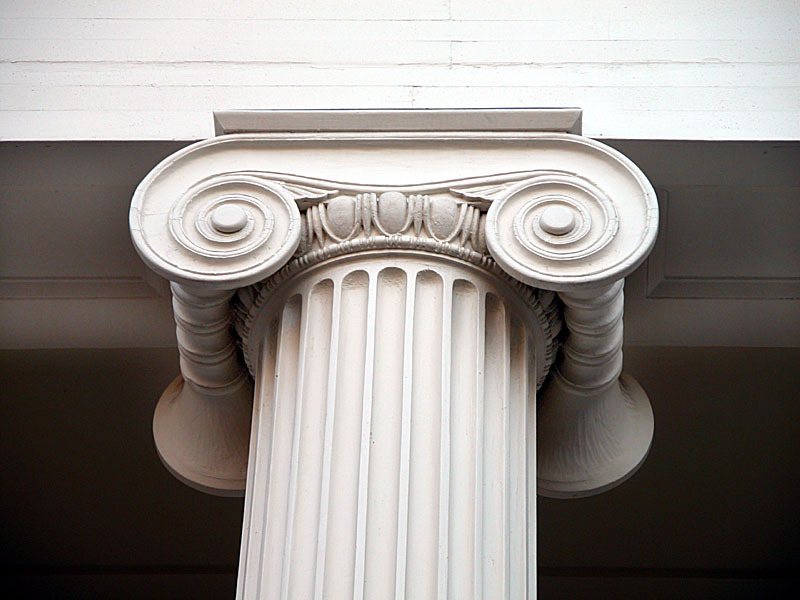 Certainly Corinthian columns do not fit with Enlightenment sensibilities about classical decorum and proportion — such people always prefer the Ionic column (I prefer the Ionic — to the right — as well so I don’t mean to cast stones). But Connelly points out that the plants in Corinthian columns hearken back to ancient myths about death and rebirth in their city. 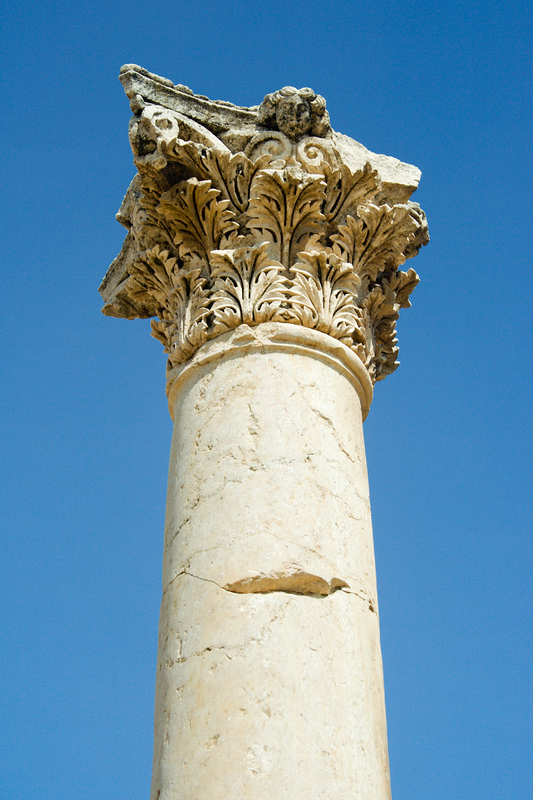 Articles may describe Corinthian columns as “one example of a Greek votive column” (as one site does) without paying any attention at all to the fact that “votive” columns, like votive candles, have a distinctly religious purpose. It’s almost as if they use the big words to obscure the meaning. We will have the Greeks be “humanists” by hook or crook. A fascinating sub-plot is the length Victorian society went to deny that the Parthenon originally was painted. Evidence after evidence turned up, mostly brushed aside and denied with too much protest. A painted Parthenon would overturn all of their ideas of classical beauty and classical purity. Whole artistic theories got erected on an unpainted Parthenon, and they could not let it go. This in turn clouded their vision in other areas, and allowed false ideas about the Parthenon to persist well into the 20th century. Did the Parthenon have no contemporary political meaning? Perhaps . . . perhaps Pericles wanted to heal the fractious wounds of a prosperous democracy. Success has never sat well with democracies, and it would make sense that Athens would want to go back to its founding and a story of sacrifice for the common good. All this rings partially true, but the bulk of the evidence makes the Parthenon an overtly religious shrine — one that seeks life from death. Plenty of evidence exists that Athenians saw it this way themselves. For example, during the plague that struck during the Peloponnesian War, sick Athenians came to the Parthenon for refuge, as well as for healing, and possibly, to die. It would be hard to imagine them doing so if the Parthenon was their equivalent of our Capitol or Washington Monument. But this interpretation also challenges my own thoughts regarding the Parthenon. The “humanist” interpretation fit how I tended to see the late 5th century Athenians as essentially worshippers of themselves. This view gets lots of support from seeing contemporary Athenians mixed with gods on the Parthenon friezes. With the Parthenon cast in this new light, I think that interpretation gets challenged but not overthrown. I think other evidence exists for seeing the Athenians as self-worshippers, and perhaps the Parthenon itself still supports that view. But this will need rethinking on my part. 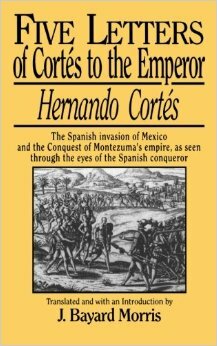 The lesson of this book is the peril of using history rather than receiving and letting it change you. Self-idolatry is alas, not only confined only to the Greeks, or the Enlightenment and Victorian eras. *To be fair, this is actually a pretty good movie . . .